Presentation eye contact is important because it impacts the way you visually connect with your audience. As a presenter in the corporate arena, you will encounter three basic types of venue. Typical conference rooms tend to be either narrow-and-deep or shallow-and-wide (illustrated below, left). The third variation, typical of many business meetings and training programmes, is the horseshoe (illustrated below). 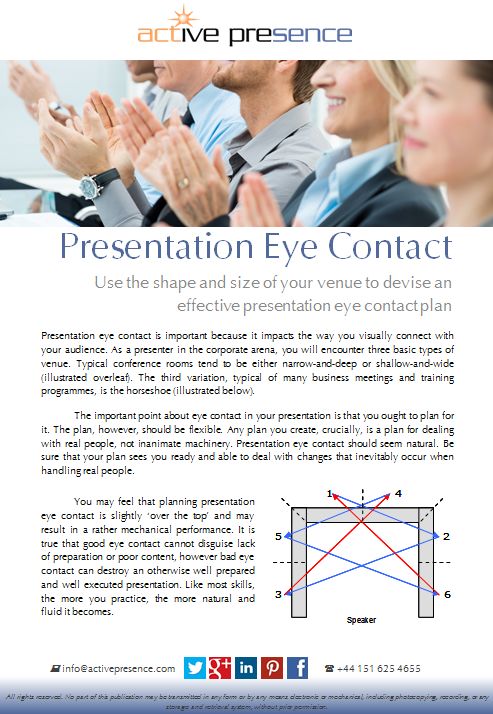 The important point about eye contact in your presentation is that you ought to plan for it. The plan, however, should be flexible. Any plan you create, crucially, is a plan for dealing with real people, not inanimate machinery. Presentation eye contact should seem natural. Be sure that your plan sees you ready and able to deal with changes that inevitably occur when handling real people. You may feel that planning presentation eye contact is slightly ‘over the top’ and may result in a rather mechanical performance. It is true that good eye contact cannot disguise lack of preparation or poor content, however bad eye contact can destroy an otherwise well prepared and well executed presentation. Like most skills, the more you practice, the more natural and fluid it becomes. 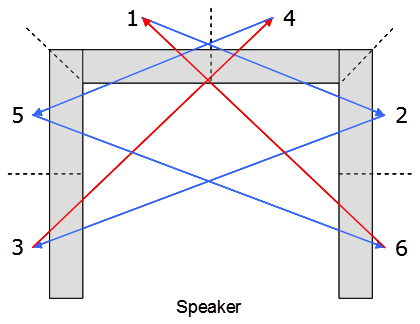 Divide the auditorium into no more than six imaginary segments, as shown in the diagrams. With respect to the horseshoe, you may be able to get away with three segments – the two sides and the seats forming the back row. Whatever the overall size of the auditorium, don't be tempted to use more than six segments – you will end up confusing yourself. 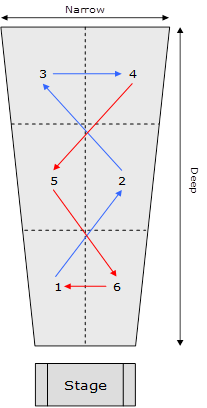 The basic concept is to move from segment to segment in a diagonal manner, front to back and then back to front. 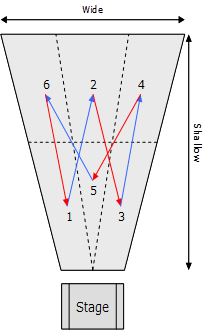 The red and blue arrows in the diagrams show the outbound and return zigzag. Each time you transit through a segment, select somebody in that segment with whom to briefly make eye contact. This will ensure that you are presenting to a collection of individuals, as opposed to a sea of faces. This will also help relieve any feeling of nervousness you may have by transferring your focus off yourself and onto the audience. There is also a more subtle overlay that comes into play when considering presentation eye contact. A number of people, for one reason or another, can become the ‘emotional leaders’ of the audience. They are the people who may appear particularly attentive, or make additional notes, or nod knowingly or enthusiastically in sync with your comments. Presenting occasional messages directly to these people can trigger an unconscious wave of acceptance through the people around them.